We host play events in the Kansas City/Johnson County area (location below)! Our winter events will be at the Johnson County Fairgrounds in Gardner, KS. We LOVE this location because it's close to I-35 and perfect for messy play! This is the best way to keep posted about our events! If you would like to be added to our email list, please use the contact form below and mention it in the comments. We would love to answer any questions you have about Purpose Play LLC or upcoming events . Please use this form to contact us! This form links directly our email account and we will get back to you ASAP! LOCATION: Our winter/spring Pop-up Play Events will be located at the Johnson County Fairgrounds, close to I-35. ​It's next to Cornerstone Park. Look for signs! (The red marker on the map below is a bit above the actual location). 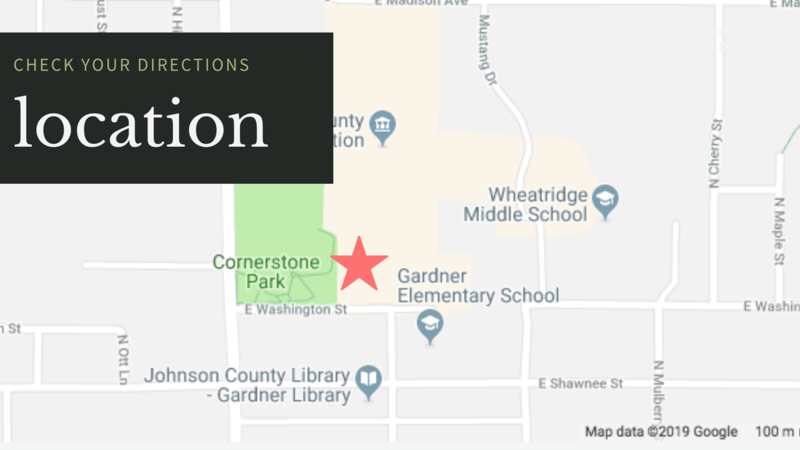 FUN IDEA: If you want to make a fun morning of it, Cornerstone park is great AND the Gardner Library has an AWESOME kid's play section...one of the best in the area!!! Our building is the Open Class Exhibits building.